Make this into a fool, fill a cornmeal tart shell, or pair with a spoonful of ricotta mousse. It’s made with a green heirloom rhubarb called Victoria, but you can use red stalks as well. Trim the ragged ends of the rhubarb. If large stalks look tough or fibrous, peel them. Chop them into chunks about an inch long then put them a 3-quart saucepan with the sugar, zest, juice and salt. Cook over medium heat until the rhubarb has broken down into a sort of a rough purée, after about 20 minutes. Don’t use the food processor — the look of the textured threads of rhubarb is appealing. Chill well. 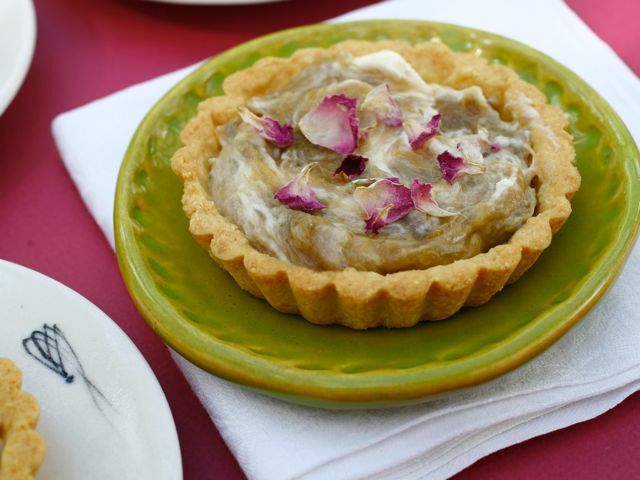 Serve cold with cream poured over, or use it to fill a tart shell and garnish with spring flowers — violets or Johnny-jump-ups.